No. of Vacancy : 1000+? 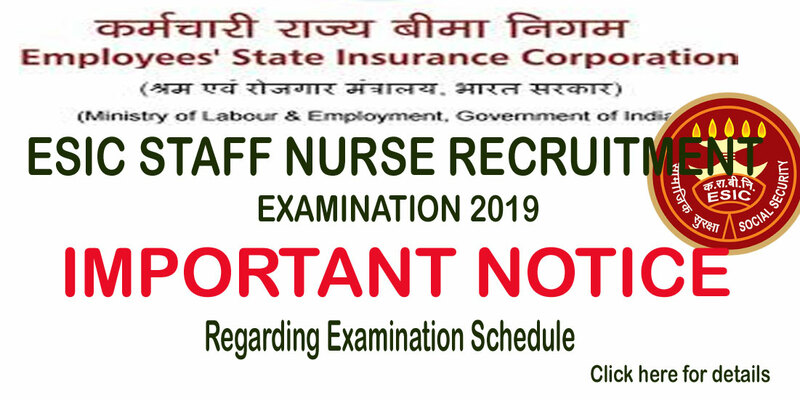 This office has received various rumours about cancellation of examinations scheduled on 26th and 27th February, 2019 for Paramedical and Nursing Cadre Posts in ESIC. In this regard this is to inform that the Written Examination (Computer Based Test) for the Recruitment to different Paramedical & Nursing Cadre Posts (excluding the post of Blood Bank Technician) in ESIC will be held on 26th & 27th February, 2019 as scheduled earlier. As such all the candidates who have been issued Admit Card for appearing in the Computer Based Test for the above posts are hereby informed Written Examination (Computer Based Test) for the Recruitment to different Paramedical & Nursing Cadre Posts (excluding the post of Blood Bank Technician) in ESIC will be held on 26th & 27th February, 2019 as scheduled. The candidates are further advised to refrain from any such rumour/news. Walk in Interview to prepare panel for the following posts on contractual basis for the session 2019-20 will be held in the Vidyalaya Premises as per the following details. Reporting time is 08.30 am.